Among the arrivals were: Common Loon and Pied-billed Grebe (both of which are usually around all winter), a Greater Yellowlegs which dropped in just as we were leaving, 3 Surfbirds which appeared on the outer rocks after the tide dropped, their sixth appearance in 20 years, a few locally nesting Cliff and Barn Swallows, 20 Cedar Waxwings (previously seen only once on 5/26/06), and a male Wilson’s Warbler by the first footbridge. Our Snowy Plovers were gone. In half of the past 10 years, they’ve left before our April birdwalk, so their absence was not unexpected, but the enclosure looked a bit bereft. Most of the ducks have left as well. Poking about in the seaweed wrack was our only Willet, in a very attractive breeding plumage, highly unusual to see at the lagoon. I usually describe the winter Willet, when on the ground, as “remarkable for having no remarkable characteristics,” but that didn’t apply to this bird with it’s scaly barring on breast and back. The group of terns kept increasing while we were there, growing from about 10 to about 70. We managed to find one Royal Tern in non-breeding plumage among the many beautiful Elegants and the much larger Caspians. Some of the Elegant Terns had pinkish breasts. This pink color comes from a shrimpy diet; the color gets into their oil gland and they spread it on their breast. The five Bonaparte’s Gulls displayed all possible plumages from dead-of-winter non-breeding to full, black-headed breeding. 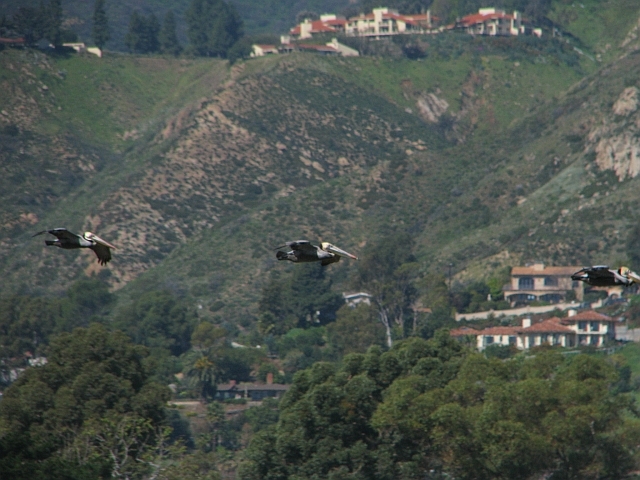 Birding at Malibu Lagoon is a lovely, peaceful, exciting, entertaining and rewarding pastime, but somebody has to do it, so it might as well be us.